Often, gardens are planned with only the daytime in mind. Under the light of the sun, many plants show off their rich colors, gorgeous textures, and stunning shapes. A world in miniature, this is typically the time of day when the garden is abuzz with activity – the birds are singing, the bees are darting from flower to flower, the butterflies are basking in the sunshine, and the breeze is heavy with delectable fragrances. But if you are like most Americans, you are far and away from this daylight ambrosia between the hours of nine and five and are missing out on the prime time of garden pleasures, perhaps only relishing it on the weekends. Moonlit gardens are a wonderful option for those who prefer to take their evenings outdoors – dining al fresco, entertaining, or taking serene strolls through the backyard landscape – while still enjoying the captivating wonder of glowing foliage, textures that play on light and shadow, and intensely sweet aromas. Creating a moonlight garden is all about selecting plants that make their presence known after dusk. Between flowers that only begin to bloom in the twilight, fragrant plants that deepen their scent into the night, and foliage and blossoms that will brighten under the moon, there are many choices you can make to add night-time interest to your outdoor spaces. Rather than carving out a solitary area for these nocturnal curiosities, it’s best to pepper them throughout your garden landscapes to foster a good balance between day and night plants. Shy during the day, these plants wait until night falls before opening up and showing off their beautiful blooms. A member of the morning glory family, moonflower is a twinning vine that originated in tropical and subtropical regions of the Americas. Blooming 5-inch wide pure white flowers, moonflower is the nocturnal counterpart to the morning glory, with fragrant blooms that open after dusk and close at dawn. As its name implies, evening primrose flowers only bloom after dusk. The common variety features large yellow flowers that emit a lemony fragrance, but Oenothera speciosa ranges from dark pink to white. While evening primrose oil is known for its medicinal properties, the plant’s fleshy, succulent roots are edible and its seeds can be used for bird feed. Also dubbed midnight candy due to its powerfully sweet fragrance that is reminiscent of freshly baked goods, night phlox is a must-have in a moonlight garden. In shades of white, purple, and maroon, night phlox unfurls its pinwheel-shaped blooms once the sun sets. Native to Peru, four o’clocks are bushy perennials that bloom aromatic trumpet-shaped flowers in shades of red, magenta, pink, violet, yellow, or white, though sometimes different colored flowers will blossom on the same plant. Closed for most of the day, the flowers will bloom come 4 p.m. and close up again the following morning. A species of cactus, queen of the night hails from Central and South America and is typically found growing on rocks or trees in its natural setting. Producing 12-inch wide, exotic white flowers with undulating petals that open only at night, it looks a little like a water lily set upon upright green fronds. Under the sun, night blooming jessamine is an inconspicuous woody shrub. Toward the evening, its bunches of slender corollas open up with tiny star-shaped white blossoms. Powerfully sweet in scent, this average-by-day number is well worth the late night wait. While still emitting a scent during the day, night is the time when these plants unleash the full force of their fragrance in order to lure in beneficial nocturnal pollinators. An evergreen shrub with huge, funnel-shaped flowers that droop lazily downward, angel’s trumpet is a gorgeous addition to the garden both day and night. The blooms can grow to 20 inches in length and up to 12 inches across, in white, yellow, or pink, and radiate an intoxicating scent that is most fragrant on warm summer evenings. A wildflower originating in Portugal and Spain, evening stock is a pretty little number that is prized more for its fragrance than its good looks. Tending to wilt under the heat of the sun, the purplish pink petals perk up after sunset when they release their heady perfume, described as a mix of vanilla, rose, spice, and cloves. Resembling Hippeastrum, ever-flowering gladiolus has buttery cream petalled flowers perched atop a twisty stalk. They release a strong almond fragrance after dusk. Nothing signifies the coming of spring quite like the unique fragrance of the lilac, which blooms for only two weeks in early May. This short window can be prolonged by planting mid- and late-blooming varieties along with the common lilac, so you can enjoy its wonderful aroma – that seems so much stronger at night – for about six weeks. Continuously in bloom all season long, flowering tobacco is indeed part of the tobacco family and contains high concentrations of nicotine. With tubular, five-pointed florets that open in the late afternoon, flowering tobacco begins to release its potent fragrance – which smells like jasmine – all evening long. 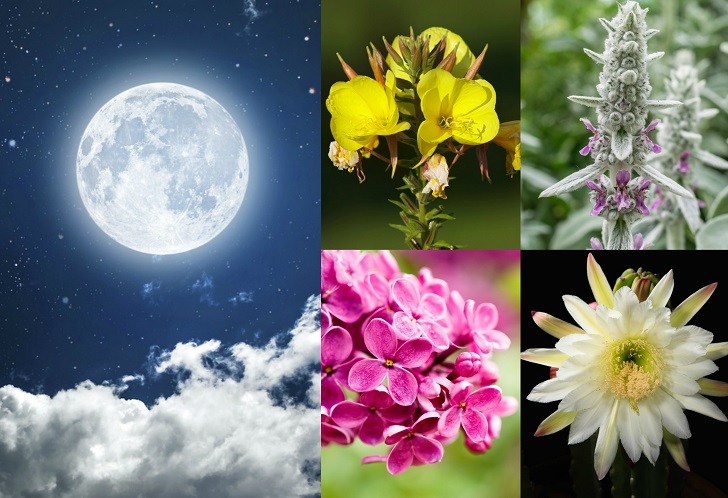 Along with night-blooming and night-fragrant flowers, adding plants that will shine under the stars is the crowning touch of the moonlight garden. You’ll want to select showy flowers in white or other cool colors like light blue, soft yellow, and lavender. Be sure to include reflective non-flowering plants to create a diverse range of textures, shapes, and sizes. Angelonia received the common name, summer snapdragon, because its long-blooming upright 8-inch spikes resemble those of the popular dragon flower. Available in several hues, the “serena white” variety is the best choice for a moonlight garden. With apple-scented foliage, summer snapdragons will stay in bloom from June to September. Native to the hot and sandy regions of California and Mexico, the matilija poppy is a large shrub that blooms with enormous nine-inch wide crinkled white petals and an orangey-yellow center. Sometimes called the fried egg poppy, it can spread indefinitely when left to its own devices so regular pruning is recommended. A fast growing perennial, silvermound is finely textured and dense with silver-green needle-like foliage that will shimmer under the light of the moon. As a good ground cover and border plant, Japanese painted fern adds a note of grace and softness to the flower bed. The willowy fronds are blue-green with silver edges, perfect for brightening up a shady spot in the garden by day and illuminating pathways by night. The heart-shaped leaves of jack frost are a grey-silver color contrasted with numerous light green veins, making this clumping ground cover plant an excellent pick for moonlit summer evenings. Clinging to trees and rock faces with its small aerial roots, climbing hydrangea has glossy ovate leaves. In June and July, it will bloom with a ring of white florets surrounding a cluster of tiny blossoms. With exquisite overlapping petals in snowy white, the alba plena camellia is commonly referred to as the rose of winter since it blooms from late fall until early spring. Found in the woodlands of North America, white trillium features a trio of white oval petals that eventually turn pink as the plant matures. An early bloomer, white trillium thrives in the shade and prefers a rich growing medium like humus soil. Soft and fuzzy, lamb’s ear is one of those plants that you just have to reach out and touch. Forming a dense array of 4-inch long silver-grey leaves that will gleam on moonlit nights, the flowering varieties of lamb’s ear will grow tall spikes dotted with teeny violet blossoms.